Stung by criticism that their proposed Garden Bridge between Temple and the South Bank was procured by a rigged process and is a colossal waste of £60 million of tax payers money, promoted as a vanity project by outgoing London Mayor Boris Johnson, thePipeLine has learned that “National Treasure” Joanna Lumley and contemporary design superstar Thomas Heatherwick, creator of the famous B of the Bang sculpture in Manchester, may be poised to announce a new garden project, which is designed to link two of the most economically challenged areas in London. Documents leaked to thePipeLine suggest that Heatherwick Studio have filed an application with Transport for London [TfL] to operate a “Garden Ferry” service on the historic cross Thames route between Woolwich in the Royal Borough of Greenwich and Silvertown in the East End borough of Newham, some nine miles down river from the site of the controversial Garden Bridge. 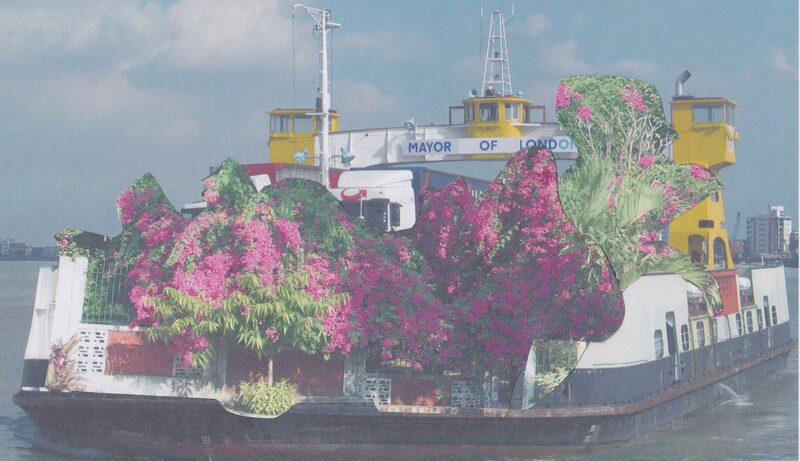 Concept drawings seen by thePipeLine show the decks of the new ferry lined with low, medium and high level planting, which will be seasonally adjusted to take account of the prevailing weather on the Thames, while the vessel’s funnels and masts are used to support various species of Ivy, Amazonian Lianas populated by south east London’s existing colony of Himalayan Parakeets and what the proposal calls a “Hi Water Line” jungle monkey walk and zip wire for children, which can also be hired for waterborne birthday parties and corporate events. London Mayor Boris Johnson demonstrating the Garden Ferry Hi Water Line zip wire to potential UK sponsors. In later demonstrations aimed at specific target markets Mr Johnson carried, Russian Federation, Qatari, Saudi and Chinese flags. The new Garden Ferry’s will also tow a self contained “Water Garden Pod”, containing waterfalls, a sensory garden and mini gym as well as WiFi. The pods, which will be designed by horticultural expert Dan Pearson, will have Russian, Middle Eastern and Chinese themes, designed to appeal to potential investors and will be available to anyone who wishes to spend more time going backwards and forwards on the river [except on the minimum of one day a month when the Garden Pods will be hired out for corporate events]. Coming in at £100 million, on top of the £50 million the ferry upgrade already announced, by TfL, the Lumley/Heatherwick proposal is heavily dependent on commercial sponsorship, with the most generous sponsors being awarded naming rights on the new Garden Ferries. It is believed that the first two vessels will be named the Rupert Murdoch Sky Boat and the Yevgeny Lebedev, named after the owner of the London Evening Standard newspaper. SKY Arts is understood to be about to launch a new reality TV competition in which Sir Andrew Lloyd Webber will mentor members of the public to write a song to inaugurate the new Sky Boat service. The provisional title of the series is understood to be “The Sky Boat Song”. Meanwhile Mr Lebedev has also been named as an “Admiral” of the new project, although Sarah Sands, friend of Mayor Johnson and editor of the London Evening Standard, has reassured readers that the close involvement of the owner of the paper with the Garden Ferries will in no way effect the Standard’s editorial independence when it comes to covering the project. As the paper points out, the Standard’s coverage of the Garden Bridge has been scrupulously even handed. Unfortunately, up to the time of publication [1 April 2016], we have not been able to verify the veracity of the documents describing the Garden Ferry project. However, given the track record of Ms Lumley and Mr Heatherwick in procuring project commissions from TfL, and tens of millions of pounds of public money from Chancellor George Osborne, and Boris Johnson, there can be little doubt that, if they are genuine, the project will be procured and approved before Mayor Johnson leaves office on 5 May and senior members of his planning staff join engineering consultancy Arup’s to help build the Garden Bridge.